In this research, Cengkareng substation serves the burden which in every year is increasing. So in this study a system of estimating the load power at the substation was made as a result of forecasting for the following year using the Time Series Decomposition model method which was then analyzed from the existing transformer capacity. The Time Series Decomposition model method is a method of combining Trend, Seasonal and Cycle to predict the electrical load power of a substation. In this study, the development of the system uses the CRISP-DM method so that the work becomes more ordered and the testing is done with MAD, MSE and MAPE to verify the error value in the forecasting results. From this study, it produces an error value of MAD and MAPE of 9.11%. These results, prove that the Time Series Decomposition model method can be used to assist in estimating the Power Load in Cengkareng Substation. Fachri Faisal, J. R. (2011). Penerapan model analisis Time Series dalam peramalan pemakaian kwh Listrik untuk n- bulan kedepan yang optimal di kota Bengkulu. Bahtiar, S. M. (2012). Peramalan Beban dengan Menggunakan Metode Time Series Untuk Kebutuhan Tenaga Listrik di Gardu Induk Sungai Raya. Rafa Weron, A. M. (2012). Forecasting Spot Electricity Prices with Time Series Models. Affandy, A. (2012). Prakiraan Daya Beban Listrik yang tersambung pada Gardu Induk Sengkaling tahun 2012 2021 menggunakan metode Time Series model Dekomposisi. Siregar, R. R. A., Sikumbang, H., & Sangadji, I. B. (2018). KWh Meter Smart Card Model Token For Electrical Energy Monitoring. In MATEC Web of Conferences (Vol. 218, p. 03002). EDP Sciences. Siregar, R. R. A., Sikumbang, H., & Pasaribu, R. J. (2018). MODEL PENGISIAN PULSA LISTRIK KWH METER DENGAN SMART CARD. 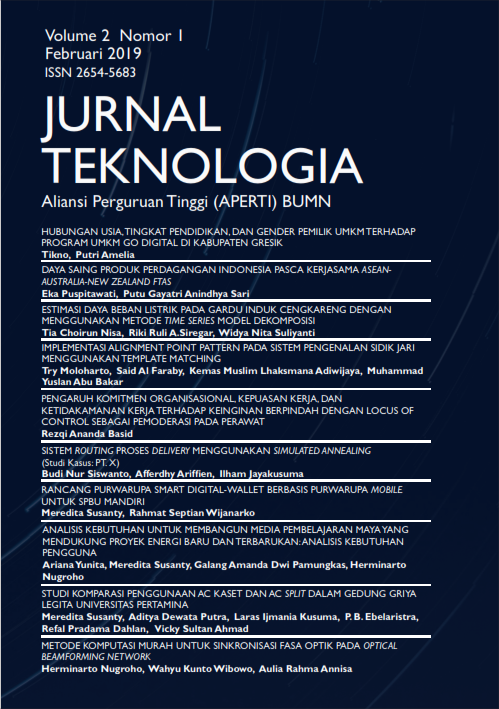 JETri Jurnal Ilmiah Teknik Elektro, 16(1), 39-54.